The picturesque village of Scheffau enjoys a spectacular setting in the foothills of the towering Wilder Kaiser mountains. The resort is linked to, and indeed is actually one of the best starting-points for, the huge Ski Welt circuit - Austria's largest, fully integrated, ski area with 250kms of runs. The mountain 'bowl' above Scheffau provides some of the best snow conditions in the area. Located next to the ski resorts of Soll and Ellma. It is easy to ski from Scheffau in the morning and visit other resorts on the Ski Welt through the day, and with a short bus transfer it is even possible to ski over to Kitzbuhel via Westendorf. Scheffau is far quieter than its neighbour, Soll and retains a charming village feel. 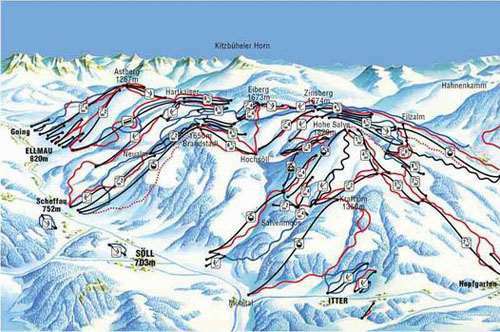 The resorts are linked by bus and one ski pass covers the entire Ski Welt. It is also a great place to learn to ski or board with wide, gentle runs and modern lifts. Children will love the 'KinderKaiserland' ski area - the perfect place to make their first tracks on skis. Quiet, friendly and informal. Try: · Kingston Bar & Almrausch. Scheffau is a great place for your children to learn to ski. You can be sure your child will get top class tuition at Scheffau's fun 'KinderKaiserland' ski school area, located at the top of the main Scheffau gondola. If you're keen for your child to try skiing from the earliest age, the ski school also offer tuition for children 2-4 years incl.